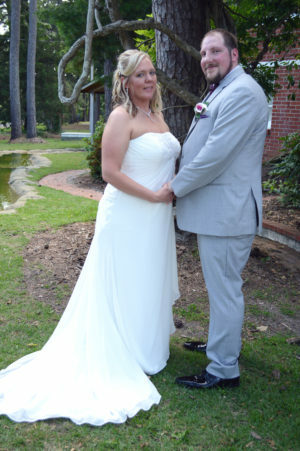 Melissa Kaye Miller, originally of Weston, WV, [daughter of Barry & Mary Ann Dempsey and the granddaughter of Frances Jeanette Dempsey] and Samuel Clifford Elerick, [son of Richard James Elerick and Daniel Paul & Tammy Sue Murphy] were united in marriage on Wednesday, June 20, 2018 in the Ivory Chapel at Wedding Chapel by the Sea in Myrtle Beach, South Carolina. Rev. Pam Muise officiated. The Bride’s attendants were Kristal Fields of Pittsburgh, PA, Monica Domico of Butler, PA and Miranda Haapapuro of Pittsburgh, PA. The Groom’s attendants were Mike Luginski of Colerain, OH, Gabriel Miller of Weston, WV and Gavin Miller of Weston, WV. After a honeymoon in Myrtle Beach, SC, Samuel & Melissa will reside in Weston, WV. Congratulations to the happy couple, and thank you from all of us at Wedding Chapel by the Sea for allowing us to celebrate your special day with you!